Mixi Avenue produces all natural products using premium ingredients to give your hair and skin optimal nourishment. CONTENTS 05 FROM THE EDITOR For our Holiday 2018 issue, we are giving you tips and information that will help you enjoy the season while staying healthy, mind, body and soul. 06 A WORKING MOM'S GUIDE TO SURVIVING THE HOLIDAYS Holly Caplan shares tips to help moms survive the holidays and keep our sanity. 16 TIPS FOR TEACHING YOUR KIDS HOW TO BE GRATEFUL Krystal Henry of "Around the Way Mom" shares tips for teaching kids gratitude. MEET JILL DONOVAN Jill Donovan, founder of Rustic Cuff, shares the passion behind her bold and stylish cuffs and how to maintain joy and love for your business as it grows. WISHING YOU A HEALTHY & BLESSED HOLIDAY SEASON During the holidays, family and friends come together to enjoy each other and take a break from life’s everyday routines. That may include a break from work or school, a trip to an exotic location or a pause on your health regimen. We want you to enjoy that pecan pie that only your favorite aunt can make or have an excuse to adjust your fitness routine to focus on quality time with loved ones. However, this holiday season we are giving you tips and information that will help you enjoy the season while staying healthy, mind, body and soul. From strategies to enjoy the holidays without gaining weight to tips to save money on holiday shopping to eight steps of gratitude, we want you to maintain mental, physical and financial health during this season. We interviewed mom bosses who have built brands that position women to live their best lives. 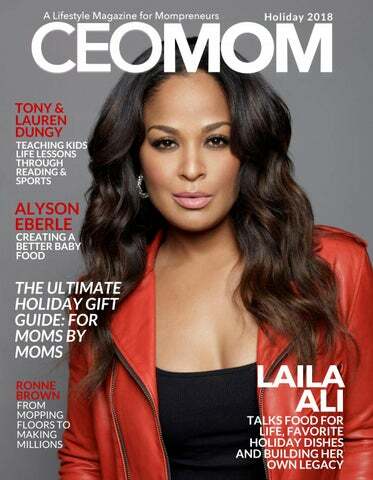 Cover mom and author of “The Food Life,” Laila Ali, teaches us that the food we eat can affect how we think and feel and our body’s overall health. She works to show people the foods they can add to their lives for better health rather than what they have to take away. Maisha Stroud of Sol Kissed Vegan shares her fitness journey with us and teaches that vegan food is more than nuts and berries. Alyson Eberle, founder of Pure Spoon, is revolutionizing the baby food industry by making 100% fresh, cold-pressed baby food that is better for baby. The holidays are hectic, making life more chaotic than usual. Holly Caplan, workplace issues expert, career coach and author, is giving us the “Working Mom’s Guide to Surviving the Holidays.” Caplan is keeping us sane as we navigate gift lists, family dinners, holiday events and more. This holiday season, have a good time but hold on to the things that keep you centered throughout the year. Whether it’s your fitness routine, your business or connecting with other women to collaborate, stay focused and get ready for the next level in 2019.
can only make two parties. It’s okay. Setting boundaries will ensure your own happiness and take a load of stress off. 5. Watch Bad Moms Christmas: Do yourself this favor. When all hell is breaking loose and Santa is loading his sled, watch Bad Moms Christmas. Get the kids to sleep, get a big glass of wine, sit on your couch and tune the world out. Find the humor in all that we do, laugh really hard and know that you are not alone. Holly Caplan is a workplace issues expert, career coach. For more information, please visit, www.hollycaplan.com and connect with her on Twitter, @hollymcaplan. CHOOSE FREEDOM. REACT. Our goal is to combat human trafficking wherever we have a presence. parents. You don’t realize how difficult it is to be a mom until you become one. You have to be relentless. You have to be uncompromising and that's how Pure Spoon came about, because I simply wanted to give my daughter the best. Tell us about Pure Spoon. What products do you offer? To put it simply, Pure Spoon is real food. The pouches and jars that have always saturated our baby food shelves have never been about quality, they've always been about convenience. The marketing may tell you otherwise, but you can't always trust everything you hear. Through the research I did while creating Pure Spoon, I learned that our traditional baby foods are able to stay on the shelves for over a year due to all of the over-processing and added preservatives. How can something that's potentially older than your child be good for them? Additionally, you learn things like how your baby's taste buds form within the first 18 months of life and it's this almost sickening realization that not only are you starting your kiddo off on something that's over-processed and lacking life, but you're also feeding them something that tastes disgusting during the prime stages of their eating development. Your food should look and taste like what it is. It should smell like what it is. Pears should be pears. Peas should be peas. I decided I never wanted to compromise on anything and in the beginning that drove my production department crazy. We wanted our cups to be completely transparent, so parents could clearly see what they were getting. We also wanted them to be 100% recyclable so we can give both moms and Mother Earth a break. What is on the store shelf was pre-processed, so we wanted to unprocess it. Up until now, baby food has been cooked in its plastic pouches or its jars. Our 100% certified organic fruit and veggies remain raw or are lightly steamed, but never boiled and certainly never cooked within their packaging. We use high pressure pasteurizationotherwise known as cold-pressed- like they do for fresh juices. This is a technique entirely unique to baby food but as I was on my journey to find the best methods out there, the whole biochemistry of it all fascinated me. When you use traditional high heat pasteurization, as most foods do, you are breaking down and then burning out the nutrients. When you use cold pressure you are still extinguishing all of the harmful bacteria while still maintaining the integrity of the nutrients in the food. It also preserves that delicious, fresh flavor. The pear tastes like a pear, as it should be. Pouches may be convenient, but they're not innovative and they're certainly not good for our kiddos. We know you started Pure Spoon to create healthier and less processed food for your baby. Describe the defining moment that made you want to turn it into a company. It's a passion of mine to see something start off small and watch it grow into something grand. It's probably the main reason why I've always enjoyed and pursued starting companies, but really Pure Spoon is so much more than just starting up a company. I want this to be bigger than even what I can imagine. People said start off small, start at the farmers market, but I didn't want to do that. I didn't want to limit this in any kind of way. I don't want to just help 10 moms, or a 100 moms, I want to help thousands, millions. I want to see Pure Spoon prosper into a household name across America and beyond. Whatever you think is right is right. Don’t let any company or packaging tell you how to be a mom... We want to be a brand that champions parents. We want to help you do a great job. There are a lot of baby food companies that claim to produce healthy and pure baby food. What makes Pure Spoon different from those companies? I always tell moms, “Whatever you think is right is right. Don’t let any company or packaging tell you how to be a mom.” If you are about to buy something and something in your gut tells you something is wrong, it is probably right. Just do your research. Believe in your heart and gut. You are the parent and you get to make all of the decisions. We are all doing the best we can and we are all so desperate to know if we are doing it right. We want to be a brand that champions parents. We want to help you do a great job. That’s why Pure Spoon is here. All we really needed was a mom to say, “Are you serious? That’s what we are feeding our kids? Pure Spoon is an organic high pressure processed (HPP) baby food company. What does that mean for moms? What it means is that the food we make in our kitchen is the same as if you were to make it yourself at home. I wanted to give myself and all moms not only a break but peace of mind. If you want to make all of this in your own kitchen, you can just look at what we're doing. There's nothing to hide, none of it is hard to do. It’s the fact that you have to do it 27 times a day every single day and we think you deserve to kick back a bit. We never want to make a mom feel like what she’s doing isn’t best. We just want to support you. We want to give you what you should be getting. If it says apples and broccoli, it’s fresh, nutrientpacked apples and broccoli. It's not a bunch of flashy advertising giving false facts. Parents should be given the tools to make an educated decision. What advice do you have for a mom who wants to start a business in the baby food industry? It’s a work out. You definitely won't need to go to the gym anymore! In all seriousness though, you can do it, don’t be intimidated by the fact that there aren’t a lot of women in the industry. First and foremost, make sure you understand the business side of it. You have to sit down and really study the financial planning of it. How much money is it going to take? How are you going to get around the funding? It's crucial to understand long term goals and short term goals. Be prepared to evolve when you are going to have to make a left hand turn instead of a right hand turn. People were constantly telling me no, constantly telling me I couldn't do this, but I saw that as a challenge. One of the quotes in my office says, “Many of life's failures are made up of people who didn't realize how close they were to success when they gave up.” We can do anything. Who is going to understand your audience and the needs of your baby better than a mom? I think that is an extremely important card that we bring to the table. As a mom with a growing food empire, what is your secret to balance? Honestly, I don't think I've figured it out quite yet. Rarely do I ever have a day where I feel fully balanced with everything. Mom guilt is real and it is heavy. The days I get it right, I feel like I can conquer the world, but I'd be kidding myself if I said I find that balance every day. I try my hardest to at least find some stability by the end of the week but, unfortunately, I am always trying to start on something new. I think that is just a part of the disease I have, wanting to always jump to the next thing. I believe the number one advice I can give though, is that you have to take care of yourself. If you don’t at least do that, then everything else is going to fall apart. Moms don't take the time to stop and breathe enough. For me, this has been the most crucial step to keeping things together. If some days all you want to do is read a book, then do that. I think it is okay to be a little selfish in order to find and achieve that balance. If you’re not okay, then no one is okay. It’s not what you say, but how you act and what you do that impacts your children. What are your family’s favorite holiday traditions? There's something about having a seven year old that still believes in Santa that is magical. That moment in the morning when she rounds the corner and I see pure joy in her eyes is worth more to me than anything that comes before or after it. How cool is it to have a child that believes there is a big, jolly man in a red suit that rewards her with presents if she was good? It's a type of magic we don’t get as adults any more- and I’m so lucky that I get to feel that moment with her. munching while crowding out extra cake, cookies and mashed potatoes. For snacks, try pairing fruit with shelled pistachios. Pistachios contribute protein, fiber, potassium, vitamin B-6, and more while also being the least caloric nut of all the nut varieties. For the same 100-calorie serving, you can enjoy 30 whole pistachios but only between 5 and 15 with other snack nuts. Setton Farms has a super convenient 100-calorie pack of pistachios which makes snacking easy. 4. Be picky: Most people tend to overeat when faced with a wide variety of options. Your best bet is to limit your choices by first doing a onceover of everything offered before taking a minute to decide what looks the absolute best and most worth-it. Then, bulk up as much of your plate as you can with crudités or any other veggie-based sides you see. Next, fill up your plate (in a single layer) with a combo of lean protein, like chicken skewers, shrimp cocktail, or smoked salmon. For the last section of your plate, add the homemade pie, holiday cookies, casserole, or any other goodie you’ve selected as your must-have favorite of the options. Try to save the smallest part of your plate for that and savor every bite! 5. Work the room: Make the party about much more than the food and the drinks. Instead, remember that this is the time of year where you get to socialize, and maybe even reconnect with friends and family you rarely see during the year. So, instead of parking yourself at the buffet or bar, mingle at the other end of the room. This way, when you go grab your plate or drink, you’re feeling completely conscious of what you’re choosing to nibble and sip. 6. Help the host: Clear plates; wash dishes; fill up champagne flutes for other guests. These tasks will not only make you friend of the year, but they will also keep your hands busy and away from the snacks or desserts after you know you’ve enjoyed enough. Another great way to help your host while helping yourself is to bring your own veggie-based side dish or appetizer that everyone can enjoy. Other guests will thank you for contributing, and you’ll have a foolproof, on-track option to add to your plate. Everyone wins! 7. Drink up: A few simple tricks will keep you from packing in the empty calories that live in most holiday drinks and from getting out of control at the dessert table after a few too many cocktails. Just like you’re planning to be picky with entrée choices, be selective with the festive cocktail you choose. Decide what sounds best to you -- a mug of buttered rum, a glass of eggnog, or another equally as delicious drink, and then choose to have just the one. You can sip that treat slowly, and then move onto something lighter for the rest of the evening, like a white wine spritzer, a vodka soda, or glass of champagne. Between each cocktail, plan to drink one full glass of water to help keep the drinks from piling up and to help you stay hydrated which will make the morning after that much more pleasant. reteaching. We all want our kids to grow into adults who say, “Thank You,” are appreciative for what others do, and who live a life that demonstrates these traits- this is why it is important to spend time teaching, and reteaching, what it means to be grateful. There is also a bit of redirection that will be necessary as well. At 6, my son has a better understanding of holiday celebrations and all of the fanfare that comes with them. So, it is no surprise that he is super excited about the Christmas holiday and he does not hesitate to share potential gift ideas with me whenever they pop into his head. It is at these moments when I listen and acknowledge him, then respond with a redirection about the real reason we celebrate the holiday. And I add that Mommy, Daddy and the jolly old man who rides in on a sleigh will take all of his suggestions into account and make the best decisions for him! I’m not going to lie- redirection is not always easy, nor convenient. I find myself doing it when I least care to and when I would like nothing more than to not engage in any kind of conversation. So, it is then that I tap into my patience bank and do one of several things: Redirect, change the subject, say nothing, or say no. Yes- “No!” I have embraced the power of saying no in a light hearted, matter-of-fact kind of way that works for me to redirect him in a pretty effective way. Moms- However you decide to teach your kids about gratefulness, I encourage you to be intentional about it. When you discuss and model grateful behavior in different settings, ask your kids questions to gage their understanding about what they hear, see and how it makes them feel. The more you make the concepts of gratefulness a part of your family the better prepared your children will be to demonstrate the skills of thankfulness, gratitude and compassion for others. want my kids to know that I was a hard worker who did everything with integrity and honesty. No matter what I have going on I want them to remember that I was always there for them. Congratulations on your new book, Food for Life. What inspired you to write a cookbook? I have been cooking since I was 9 years old. I have always loved cooking simple meals and creating experiences in the kitchen. My experience with nutrition taught me that the food you eat can affect how you think and feel and your body’s overall health. I want to encourage others to live a healthy lifestyle. There are so many food related illnesses such as heart disease, especially in the African American community. Heart disease is the number one killer. This is really an epidemic and I want to take the lead in the fight for better health. The approach I take is to show people the foods they can add to their lives for better health rather than what they have to take away. It allows me to present food and nutrition from a more positive angle. The cookbook is an extension of my knowledge on nutrition and the Laila Ali brand. Who is your greatest culinary influence and why? What recipes in the book reflect that influence? I would say my grandmother because she is the one who used to make amazing meals from scratch that inspired me to start cooking. I would call and ask her how to make gravy and the roux for gumbo. She would teach me how to make her dishes. It really gave me the confidence to know that I can do anything. I developed a love for food and cooking though her. I look at recipes but don’t necessarily follow them. I will look at the dish and come up with my own way of making it. The recipes from the book that were inspired by my grandmother are definitely the gumbo and the stewed chicken. If you do not nourish yourself as a woman you are not truly going to be happy. You have to take care of yourself, especially if your end goal is to be your best for your children. You started cooking at 9 years old. How are you passing down your love for cooking to your children? My children are always around me when I am cooking. They watch me so they are seeing me prepare dishes and create recipes. Sometimes they help me in the kitchen with things like mixing and pouring and even chopping if they can use a dull knife. I think that it is important for kids to see where food grows and where it comes from. Our culture is so comfortable with fast food and kids often think that’s real food. Processed and packaged food is not real food. I’m not a fanatic about this. My kids can have a bag of cheese puffs. But I believe it’s what you do 80% of the time that really makes up your quality of health. What is your favorite holiday recipe to prepare? I really just think of something that I would not usually make the rest of the year so I would say candied yams. That is definitely not something I can have all year, but is a must for the holidays like Thanksgiving and Christmas. Throughout the year, I will definitely have my sweet potatoes with cinnamon, but there's nothing like adding the butter and sugar for the holidays. You are an undefeated boxing champion, author, chef, television host and entrepreneur. With such a diverse and profound career, what advice do you have for a mom who believes it’s too late to pursue her dreams or reinvent herself? It is never too late to reinvent yourself. You can do it if the passion is there. There are always going to be roadblocks no matter what you do. People quit when the road gets tough. That’s the time you need to work harder and take the time you need to get it done, even if it’s just 15 minutes a day. Carve out those 15 minutes to half an hour to give time to what you are passionate about. The key is to be consistent. I don’t know how many times I have gone from doing one thing to something new. Nothing I have done has been simple. When I became a boxer people told me I couldn’t do it, because I was too pretty. I worked hard and here I am knocking people out. Then I wanted to be a television host. The athletic image wasn’t what they were looking for. I went on Dancing with the Stars to show my softer side. Now I am a television host. You have to be smart and go for it even when you’re scared. Even when you’re uncomfortable you have to put yourself out there. Be smart and go for it! You did an interview where you said that mothers should do more than raise their children. What does being more than just a mom mean to you? Before you had your kids you went through your own stages to become a girl and then a woman. As you aged, you grew wiser and developed a sense of self. You were getting closer to being the woman you are now. I am not the same person that I was at even 20 years old. I am 40 now and I have different goals and needs. I even choose those who I call my friends differently than I did 20 years ago. Once you have kids, it all becomes about them. Sometimes we lose ourselves in motherhood. I want to do it all. If you do not nourish yourself as a woman you are not truly going to be happy. You have to take care of yourself, especially if your end goal is to be your best for your children. I tell my kids to make sure they brush their hair and their teeth. Get up and get dressed even when you don’t have anywhere to go. Look like you care about yourself. We as moms have to do the same thing, look like we care about ourselves. Your kids are watching you. Whatever you want your legacy to be work towards that. You want to be that mom where your kids can say no matter what mom made time for us. When I needed to talk or needed her she was there. I don’t want to be that mom who is always too busy to be there for my kids. Take care of yourself so you can give them your best. Pursue your passions and make yourself a priority. What’s next for the Laila Ali brand? Of course, I have my blog, lailaalilifestyle.com. I have a nutrition product, YouPlenish, for women that is coming out soon. It’s really for everyone, but I made it especially for women. It will consist of everything from protein powders to vitamins of high quality pharmaceutical grade. People can sign up to my list on my website to find out more. It will be available online at lailaalilifestyle.com. Fashion X DFW:: South Asia Saturday, October 13, 2018, 6500 Cedar Springs, Dallas, TX 75235 Fashion X hosted its 5th Annual Fashion Show CEOMOM Magazine was excited to be in the house for the highly anticipated Fashion X (creator of Austin Fashion Week, Fashion X Houston and Fashion X Dallas) which attracted international attendance uniting both East and West cultural fashion for an evening that was as beautiful as it was majestic. The “East meets West” fete welcomed four designers from across the globe: Rana Noman (Pakistan), Varun Bahl (India, featured in Vogue India and considered to be the “Versace” of Indian fashion), Maryam Khizer (Pakistan), and Erum Khan (Pakistan). Other local South Asian designers who showcased were: Silk Threads by Ruby Bhandari (Indian – Dallas-based), Nava by Ayesha Qasim (Pakistan – Dallas-based), and Jaya Shukla of Bridal Motif (India – Austin-based). Each designer received standing ovations following the finale walk of their collections on the runway. Founder Matt Swinney emceed the production donning modern Indian garb by Silk Threads, as guests enjoyed South Asian cuisine, with cocktails and spirits provided by Peroni, 1876 Whiskey, Dripping Springs Vodka and Republic Tequila. Spotted in the audience was Emmy-Nominated Top Chef Tiffany Derry, Award-Winning Entrepreneur Danyel Surrency Jones, Dallas Influencer Rachel Chang, Channel 8 “Daybreak” News Anchor Kara Sewell, JackSon, FunAsia’s Vaishali Thakkar, Best-Selling Author Cheryl Polote-Williamson, and more. “Dallas needs more events like this,” blogger Sylvia Aziz noted following the event. While Indigo 1745’s Keith Manoy exclaimed, “This show was blazing!” Retailers and designers House of Dasha, Miles David by David Peck, Valerie Garmino, Shusi, House of Cynthia, and Abi Ferrin also showcased and received standing ovations during the event. Bold, confident, vibrant, gorgeous and sophisticated are all words used to describe the House of Dasha debut at Fashion X DFW:: South Asia this past October. Founder and owner, Quiana McDaniel debuted her line full of bold colors, textures and African inspired prints. CEOMOM Magazine chatted with Quiana during the hustle and bustle of the event about future plans for House of Dasha and what being a part of Fashion X Dallas meant to her. Tell us a little bit about House of Dasha. When did you start and what was your inspiration? I started Dasha Cosmetics four years ago with just makeup because I was allergic to everything. From makeup, my customer base wanted clothing so we created House of Dasha. I give my customers what they want. Describe the House of Dasha woman. My clothes are for the everyday woman who just wants to be fabulous. We like to take your inner beauty and highlight it. We take nothing from what you have, we just highlight it. We cater to sizes small up to 3X, and in some cases 4X. In addition to working with designers, House of Dasha has a personal line. When did you start your line and what is your signature look? My history is in fashion. I went to The Art Institute of Chicago years ago. I had to stop, because I had a small baby. I then worked in the finance industry for 10 years. After my career in finance ended, I decided to go back to my passion which was fashion and beauty. My line is inspired by colors and prints such as African designs. What looks did you debut at Fashion X DFW:: South Asia? You saw beautiful trends that highlighted stripes, floral, chiffon and sequins. We focused on textures and bold colors. We wanted our line to be exciting and fun for fall. What did being a part of Fashion X Dallas show mean for the House of Dasha? Being a part of Fashion X Dallas meant the world to House of Dasha. To share the runway with such talented designers was such an honor. It was more than I could have ever dreamt. I’m extremely thankful for the opportunity. What can we expect from House of Dasha in 2019? In 2019, we are hoping to open a second store location in Fort Worth or Plano, Texas. We are already in DeSoto, Texas. GlamCon 2018 Presented by The Pink Peppermint Project and Style Follows Her, founded by Shantaquilette Carter GlamCon, hosted by The Pink Peppermint Project, is unlike any other event. Held in Dallas, Texas on Saturday, October 20, 2018, the event celebrated breast cancer survivors, fighters and their caregivers and family and friends with a day full of beauty, inspiration and sisterhood. These glamorous conquerors were pampered with beauty services and makeovers to remind them that breast cancer cannot steal or define their womanhood. In the 2nd annual event, GlamCon provided women with beauty resources for their skin, empowerment workshops for their spirit and networking with inspiring women for their soul. Presented by Dallas’ lifestyle brand and beauty blog “Style Follows Her," GlamCon celebrates life, survivorship, and friendship. GlamCon is transforming lives and giving women permission to embrace the beautiful warrior inside of them. The event was emceed by entrepreneur, model and philanthropist, Anita Hawkins. Hawkins shared the story of her mom's cancer diagnosis and the importance of not walking alone and letting others know when you need help. Leah Patterson, transformation specialist and founder of MOVE Makeup, led the group in meditation. Patterson prompted attendees to go into our chokras to explore our connection to God and ourselves. Vocalist, Titia Owens, inspired everyone with her original song, "Greatness." The keynote speaker for the event was Crystal King, National Director, Multicultural Marketing and co-founder of the LoveKings brand. King shared the story of her cancer diagnosis and how she garnered strength from another survivor, her mother. There was a Zumba Fitness Hour sponsored by Danyel Surrency Jones of Powerhandz, as well as vendors for shopping, a Kendra Scott glam bag filled with beauty and health items, food, panels and more, CEOMOM Magazine served as one of the media sponsors for the second year in a row. To learn more about The Pink Peppermint Project and GlamCon visit http://www.glamconevents.org/. eam Dungy moves beyond the football field and the classroom to teach and inspire kids through a series of sports related children’s books. Tony Dungy, former NFL coach, author and sports analyst for NBC Sports, along with his wife Lauren Dungy, an early education specialist and author, have used their Christian beliefs and love for sports to equip kids to deal with life’s challenges. Using Biblical principles, Team Dungy’s 2 latest books, Austin Plays Fair and Maria Finds Courage, presents relatable life lessons about honesty and trying new things. CEOMOM Magazine caught up with these busy parents of 10 to discuss family, faith and football. What inspired your latest book titles, Austin Plays Fair and Maria Finds Courage? What can we expect from future titles in this book series? Lauren: We wanted to select book titles that children would read and find relatable. We wanted them to say, “I have been through that. I have been in a situation where things didn't go the way I wanted them to on the field.” We felt we were able to accomplish that with Maria and Austin. They experienced things that many children do when participating in sports. When they have compassionate coaches and teammates who want to do the right thing, they can flourish. Tony: When we first started doing this Lauren and a group of coaches’ wives and players’ wives would go out and read to inner city school students. We were really challenged in looking for things to read. We wanted to have a message and topics the kids could relate to and are centered around godly principles like listening to your parents and being a good friend. We wanted to have a message that was fun as well. We also aimed for diversity. We wanted kids to see kids who look like them. Tony: It’s funny you ask that, because I am riding in the car with our son Jordan who is now 17 years old. When Jordan was very young we were at a football game where we talked about the need to stay with each other. Jordan got lost when he wandered off from us. A Team Stays Together was strictly from our lives. In our stories we like to have an adult like the teacher, coach or the parents be mentally supportive and engaging, and concerned about the situation so the kids know to turn to the adults for guidance. We teach the kids they don’t have to navigate through life’s challenges by themselves. What do you hope parents gain from reading your current book series? What lessons do you hope children learn from Austin Plays Fair and Maria Finds Courage? Tony: The biggest thing we want parents to know is how important the role they play is. Kids will look to others for support such as their friends and teachers but it is better when parents are involved. Lauren: Many times kids feel like they have to fend for themselves. They are embarrassed to express their inner conflicts with people. Kids need to know it’s normal to be shy about trying something new. It’s hard when you have to do something that is not popular. They need to know that their parents will walk through the challenges with them and model the right thing to do. In your previous book series, you covered topics such as finding your gifts, perseverance, honesty, bullying, friendship and faith. How much of your experience as parents do you draw from to create the stories in your books? Lauren: We have 10 children and they are wonderful kids. They have all experienced challenges and similar situations that when handled correctly have positive messages. From their experiences we’ve touched on how to be a good friend, how to care about somebody and how to tell the truth in a situation where it is uncomfortable. We draw on personal experiences from our own family. Our kids were happy to be the main characters. They were happy to help other kids to grasp good concepts and help others to have a good spirit of cooperation when they are engaging in sports and with other people. We enjoy putting our children in the stories. We wanted to select book titles that children would read and find relatable. We wanted them to say, â&#x20AC;&#x153;I have been through that. We wanted to have a message and topics the kids could relate to and are centered around godly principles like listening to your parents and being a good friend. are stretched in so many different directions that there has to be balance in the order that we do things. When organizations and ministries contact us, we have to pray about it and look at the organizations and the ministries to determine if we want to be involved in their work. We believe many kids need those organizations. Lauren, you are retired as a teacher but are still very much involved in early childhood education through your books and the Dungy Family Foundation. What inspired you to continue your work as an early childhood education specialist outside the classroom? I feel it is a number of things. One, it felt like I was given a platform to help and encourage others. My inspiration comes from my love for children and families. Through our foundation I have been able to get involved with projects and programs that are beneficial to others. Our programs support and encourage other organizations and bring empowerment to parents. We have been able to walk alongside adoption agencies and pregnancy care centers. Either we are the voice to speak to people in the community and walk with them or we help financially. I enjoy investing and pouring into the community. Retirement is not in our vocabulary. This is something that we will do for years and years to come. What are your favorite family holiday traditions? Lauren: We have a lot of things we enjoy. On Christmas Eve we get together as a family to bake cookies and sing Christmas carols. We go around the neighborhood and sing with other families. We open one gift on Christmas Eve which is usually the gift where our children drew names. We present that gift to the person. It’s fun to see who drew whose names. We just enjoy having fun times around the Christmas tree and singing songs. Often times we will have the kids play their favorite songs and sing around the piano. We always enjoy Christmas. Tony: The biggest tradition is the family picture. Every year Lauren picks out a theme and gets all of the kids and parents dressed in the same thing. Some take 5 minutes and some are more elaborate. They are always very nice. As the family has grown, getting the older kids, who are in their late 20’s, back into the fold has been challenging, but it’s always a lot of fun. Get your copy of Austin Plays Fair at https://www.amazon.com/Austin-PlaysFair-Dungy-Football/dp/0736973249 and Maria Finds Courage at https://www.amazon.com/Maria-FindsCourage-DungySoccer/dp/0736973230. the things I would never do. Six months later she came to Tulsa and asked if I would reconsider. I said, “No, it’s not something I want to do.” Three months later she came back with a mockup of the cover. I felt like at that point it just seemed right. I felt it. I gave it a shot. I finally had a peace I hadn’t had until that moment. I sat down and started to write and learned all about the process of writing a book. That is a huge commitment. on rusticcuff.com. This is year six. I started doing it four years ago for fun. What we realized three years ago was people would go crazy over the new and the first. They want to be the first to get it before it sells out. This past year we had a snow globe. Each day you would shake the virtual snow globe. Once you would shake it, it will reveal what the cuff would be for that day. What has been your greatest challenge growing your business while being a mother? The biggest question is how do you balance motherhood and business. You don’t balance. You make it all into this one world. Instead of saying this is my life at home and my life at work, I just say, this is my life. The biggest challenge is not feeling bad when you are in Rustic Cuff world and not feeling bad when you are at home. Be 100 percent present. It’s having the flexibility to go back and forth without the guilt. There is really no good way to balance when you let go and say all of this is my world. It’s not just the time that your kids are home or at school. Right now I have 150 employees. My employees are allowed to bring their kids up here without asking. It helps a lot of moms to give them the freedom to not feel like they are managing two totally separate worlds. What are your favorite family holiday traditions? I grew up in a Jewish family for the first nine years of my life. Then my family converted. My first Christmas tree was at nine years old. Most kids have all these memories when they were little. I have very little. For my husband, on every light switch was a Christmas decoration. My mom and dad were such minimalists. It’s the merging of those two that make up our biggest traditions. It’s the nights leading up to Christmas that we spend at home cooking together and listening to Christmas music and staring at the Christmas tree. My mom never celebrated Christmas because she thought it was so much work. She would decorate this massive Christmas tree and put a sheet over it with a note that said “Do not open until Christmas.” Now my husband has this tradition where he has to pull out all of these lights. I love to celebrate Christmas. It is so magical. Learn more about Rustic Cuff at https://www.rusticcuff.com. You can’t force change. You need to allow it. And a key to allowing it is accountability. When we take accountability for every aspect of our lives we are in the most powerful position to allow change to occur. Implementing these 8 steps of gratitude will help you create remarkable change for good in your life! 1. Appreciate everything. Even that which you judge as bad, wrong, and painful. 2. Express gratitude for every single moment of your life. The more you create feelings of appreciation and gratitude, the more you will attract into your life which you can appreciate and for which you can feel gratitude. 3. Gratitude is one of the highest vibrations in which we can be. Look for things for which you can be grateful. Play the Grateful Game. By yourself or with others, take turns saying what you are grateful for. 4. Start a Gratitude Journal. Every Thanksgiving, as a family, we get out our Gratitude Journal and write 1,000 things for which we are grateful. We number from one to 1,000, leave it on the kitchen counter with a pen, and family members and friends are invited to write in it as often as they would like. It usually takes us between a week and ten days to get to 1,000. 5. If you pray, thank God for believing in you, for giving you the agency to create your life, and for remembering your truth. These simple steps of gratitude address the core issues that most people struggle with at a deeper level of their being. Putting a daily focus on these moments of thanks will shift your core vibration which allows greater shifts in your life. Remember, you DO have the power to change anything in your life. Whether the actual event changes or you change your response and perception, both create a new experience. And the first big step to making use of that power is by showing gratitude for your life. Be accountable first, and great change will follow! Carol Tuttle is a teacher, speaker, gifted healer, best-selling author of six books, and pioneer in the field of personal development. For over 25 years, she has supported millions worldwide with her life-changing books and online courses. Her newest book, "Mastering Affluence," guides you through six transformative lessons to create a life you love. Get your copy and learn more at https://ct.liveyourtruth.com/. 6. Thank all the people who have shown up in your life to play their parts for you. 7. Write a thank-you note once a week to someone to express your appreciation for them. 8. Most importantly, appreciate yourself for what you are remembering and for the joys you are creating. Subscribe to this digital magazine dedicated... to celebrating the creativity and brilliance of today's youth. Your Kids’ FOMO Is Not Worth More Holiday Debt By: Jeff Dixson, “The Retirement Coach.” Jeff is the founder and president of Northwest Financial & Tax Solutions, Inc. The Experience of Events We pursue with passion to provoke others to live with purpose! We are a full service event planning company. As leaders in the industry, we stand firm behind our vision to serve every client, partner, vendor and guest in the same passion we desire to serve Christ, in excellence. THE HIVERY: A COMMUNITY WHERE WOMEN CAN COLLABORATE AND CREATE As a former professional ballet and modern dancer, Grace Kraaijvanger had a dream to have her own dance studio. In the midst of her search for the perfect space, another dream was revealed, one that was more about building a community for women to collaborate and create. With kindness, creativity and community as THE core values, Kraaijvanger founded The Hivery, a beautiful, collaborative and creative coworking space and inspiration lab where women can realize and embrace their worth by pursuing their passions, finding their "What's Next," and supporting one another along the way. CEOMOM caught up with Kraaijvanger to discuss the inspiration behind The Hivery and why it is so much more than *just* a coworking space -- it’s a movement. week – and it paid well – I couldn’t stop dreaming about starting a business based on what I was passionate about. The Hivery was born from my love and desire for a creative, collaborative, and supportive community. Something similar to what I had when I was a dancer, but that supported any and all types of “dancers” (no pointe shoes needed). I live about 15 to 20 minutes outside of San Francisco and my kids are now in their teens. Ben is 13 and Jane is 15. I have an awesome, supportive husband and a really cute, crazy miniature dachshund named Moxie. She is complicated, but I love her. Tell us about The Hivery. Describe the space as it relates to purpose and mission. The Hivery’s mission is to elevate the voices of women. We believe every woman has something inside of her to contribute and offer to the world. And we want to empower her to realize her most purposeful work and life. We owe it to the world to share our gifts with others. I also believe (and have witnessed first-hand) how hard those gifts can be to find and express when you are by yourself, when you don’t have a community to lean into. I am very interested in the magic that happens when women get together. People always ask me, “Do you ever get negative or competitive women in the space?” The answer has so far been “no” because we have been very true to our values and that truly resonates throughout – and inspires the space and fuels the community. The Hivery has three strong values. Kindness is first, beginning with the way people are greeted when they walk through the door and into the space. Creativity is second. We believe everyone is creative, from our accountants to our poets. I have watched what happens when you are in a creative space, and it is beautiful and transformational on so many levels. The third value is Community, which is the idea that the whole is greater than the sum of the parts. In other words, together we are able to elevate each other to a level that is much greater than what we would otherwise do on our own. I have watched again and again what happens in work when women feel supported and safe. While The Hivery at face value is a female-fueled coworking space and inspiration lab, the former terms are simply the transportation for the deeper work we are doing. Yes, it is a space for workshops, learning, and working, but there is a deeper layer that goes far beyond a space to put your laptop and focus in. I made a commitment from the beginning that The Hivery would operate from an authentic space, physically and metaphorically. I will always speak from and lead with my heart – even as we grow (especially as we grow). Why is a coworking space exclusively for women so important? The Hivery actually welcomes anyone who believes in our mission of elevating the voices of women. We do have a few male members now who are drawn to the work that we are doing and the calm, welcoming beauty of the space. When I first started The Hivery I was looking at different spaces. It was when the term "coworking" was still little understood. Everywhere I went was very male dominated, down to the decor. This didn't inspire me. I didn't feel like I belonged. So, I started to look for spaces that had more of a female focus. When I began creating a space that I would want to belong, I realized so many women were also seeking a sense of belonging and a desire to be understood. Women are often going through a state of transition and transformation. It can be anything from having your first child, deciding not to have a child, being an empty nester, wanting to start a new career, or wanting to flex your artistic muscles for profit. These transitions are often scary to go through on our own. When we are alone, we tend not to do things that seem scary. I feel very strongly that women need each other, now more than ever. We all know that there are equality gaps in pay and executive roles and politics, and when we create a space where people can be creative and feel supported and inspired, we are empowering women to close those gaps. For our Summer 2018 issue, we interviewed a mom who is opening a coworking space for new moms. What were your biggest challenges when opening The Hivery? What advice would you give to her? I was way out of my comfort zone with things like negotiations, corporate leases and staffing. I think part of it is doing hard and scary things that you don’t know how to do. I was scared. It was a big financial risk for me. But I know it is far better to fail and try than to never have tried. I asked for a lot of advice and I relied on mentors when I was starting. I looked for mentors in unusual places. I met with anyone who would talk to me. I was very open minded in terms of looking for mentors and found them in places I would have never expected. People I now count as my dearest friends. The second piece of advice whether it is you or someone you hire or work with, get very strong financial planning in place from the get-go. I study my profit and loss every week. I know exactly what is happening financially in my business. It is so important to really get in there and own your books. Fall in love with and understand the numbers, no matter what they are, so you can help them grow. In general, I am so interested in women building financially thriving businesses. So much of our power can also lead the way we manage our dollars and the way we use our money. I think it is important for women to know their value. Women who are financially empowered and owning their value both literally and metaphorically affects how they own their contributions to the world. I love your quote, “This place has a magic to it. It holds and creates support, visions, dreams, kindness, knowledge, and the brilliance of women. I have wanted to open a creative, collaborative center for people to cultivate themselves for many, many years. This is my chance. This is my something?” Describe the defining moment when you knew you The Hivery was your something? How does The Hivery help women find their something? I had dreamt about the space for women for a very long time. When I was in my 20’s I was interested in opening a dance studio. I would go around San Francisco for spaces to open one. There would be open spaces with high ceilings, floor-toceiling windows…but oftentimes the space wouldn’t be right for the dance business we were trying to open. I would think, 'wouldn’t this be a great space for women?" Coworking spaces weren’t around back then, so I would just think about how I would create a women’s collective. The idea came back in my 30’s. I called my friend and told her I wanted to create a space for women. She said, “You told me this idea 10 years ago!” I realized she was right. I’d been wanting to realize this idea for more than a decade! I decided to not let another 10 years of sitting and waiting for the “perfect” time to open my dream business pass me by. Now, five years in, I know with one hundred percent certainty that this is my most meaningful work because when I am in the flow, everything lines up. Everything I needed was there for me as soon as I acknowledged that this was my life’s work and was willing to commit to its success, no matter what. Tell us about The Hivery’s Entrepreneur + Inspiration Lab you hosted in October. What was the purpose of the event? What do you hope women took away from the event? It was our third year. Our first two years sold out within two weeks. We decided to play bigger this year. We were at Fort Mason Center for Arts & Culture, a beautiful venue along the water. There were over 300 amazing women there. We added “inspiration” to the name this year because we noticed so many women who came to the event in previous years didn't call or think of themselves as entrepreneurs. They were writers, stay-athome moms; they were wondering what their next chapter was going to be. No matter how they identified themselves or what they were seeking, they wanted to put themselves out there. They wanted to play bigger. They wanted to sow the seeds of transformation. We had such amazing speakers, including Marie Forleo and Dr. Tererai Trent, an incredible and intelligent humanitarian from Zimbabwe. She worked with Oprah to bring the girls leadership academy to South Africa. She talked to us about our unique power to change the world. There were so many beautiful, inspiring keynote speakers and workshop sessions. We bridged the gap between empowering elevated thinking and practical teaching. We ended the event with a celebratory happy hour and everyone left on cloud nine. You have dedicated yourself to women’s empowerment. What does real women’s empowerment look like? I think it is about inspiration from the inside out while honing in on our unique potential. Each of us possess a beautiful combination of experiences, talents and gifts. I want to help each of us tap into what we can offer to the world. But I also know that just "tapping in” isn’t enough. It has to go beyond that layer, beyond seeking and finding clarity around what you are passionate about. We have to ask ourselves what action we actually want to – and can -do to make an impact NOW. That second, deeper layer is what is truly important. It goes beyond the fluff of inspiration and ideas. It combines the inspiration with the action to realize the bold impact. What are your family’s favorite holiday traditions? I have a pretty big family. We have a very rustic family cabin in Minnesota. My mom grew up going there. One holiday season a couple of years ago we were visiting some aunts and uncles and they decided to visit a cabin next door. It was really a winter wonderland. One night we played hockey by the moonlight and that was really special. That was a one-time thing. My favorite holiday tradition is decorating the tree. I grew up decorating the tree with my mom. We would all have our special ornament. I bought that tradition forward with my kids. I love their expressions when they get a special ornament from a trip. I love when the kids are off and there's cozy movie days or pajama days. Learn more about The Hivery and their new virtual membership at https://www.thehivery.com. From teenage mom to janitor to millionaire, this describes the journey of serial entrepreneur Ronne Brown, founder of Girl CEO, Luxe for Brunch, High Heels and High Goals and author of Amazon’s Best Seller “From Mopping Floors to Making Millions on Instagram.” Brown has defied all odds to realize her dreams of rising above poverty and create her own blueprint for success. Ronne Brown is a mother, coach, author, speaker, entrepreneur and overcomer. She has influenced thousands of entrepreneurs by teaching them to achieve success on their own terms. Brown’s mission is to help as many women as possible become girl bosses and shift the trajectory of their lives by believing they are more than what their circumstances say they are. 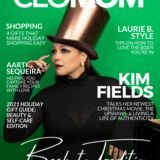 CEOMOM caught up with this busy mom of four to talk about her passion for empowering women and the defining moment that pushed her from janitor to millionaire. Who is Ronne Brown? What do you do? Ronne Brown is a full-time mom and entrepreneur. I equip women with the tools to become the CEO's of their businesses, lives and homes. What is one quote that best describes your life motto? “Less excuses, more solutions.” It means that you can sit around and point out all the things that won’t go right and make excuses or you can use your energy to find solutions. I personally want to find solutions rather than focus on what is wrong. Tell us about GirlCEO and what inspired you to start it? Girl CEO is an organization that equips women to be the CEO's of their businesses, lives and homes. I was led to start Girl CEO based on the lack of community and support I had when attempting to start my own business. I felt so alone and misunderstood and I wish I had a community of women to talk to about the process of getting started. My goal is for Girl CEO to be that for other women. Whether it’s our inspirational merchandise, business masterminds or community meet ups, we want every woman to feel like we have their back. and getting there two minutes late and being told I was fired. I remember getting on my knees pregnant, begging my boss to let me keep my job. She watched me do this and let me work until three that afternoon, and then fired me. The defining moment for me was driving home not knowing how I was going to take care of my family. The first thing I had to do was to pull myself together emotionally. I had to start thinking positive things. Doing affirmations and positive thinking changed my life. I started telling myself that I am going to overcome this and that God had something better for me. I started to speak greatness over my life. I asked myself, "What is it that you love? Find a way to monetize what you love. As I started to look around my house it was wellness and beauty products. That is what birthed my first business. I had $250 to my name. I tell women, if you have a product that you love you can sell it. Find that product and put it out there and get paid for it. It’s too easy for us to do this as women now. How has your role as entrepreneur impacted your roles as wife and mother? For me I would say it has impacted my family tremendously, specifically my children. They are aspiring entrepreneurs. They want to be involved and they want to help me. They are very cautious about what I am spending my money on for them. It has really impacted their mindset. If the readers look on my social media they will see my children working in the warehouse with me. I want them to have an incredible work ethic. I want them to know that the glamour comes with a lot of hard work. I tell women, if you have a product that you love you can sell it. Find that product and put it out there and get paid for it. What’s next for Ronne Brown? Right now we have the Girl CEO Society. We do a webinar once a month on different topics, giving women tools to increase their income and be more efficient in their businesses. We also do free events to let people know that everything doesn’t have to have a price tag on it. We send out an email a few weeks before the actual date of the event. I also have a Girl CEO app. Everyone can download it on iTunes. You can learn more at girlceoinc.com. ometimes the unexpected turns on life’s journey inspire you to make lifestyle changes that position you as a leader and trailblazer. Maisha Stroud, wife, mother, attorney and founder of the vegan lifestyle blog, Sol Kissed Vegan, started her health journey because of her mom’s cancer diagnosis and her own medical challenges. Inspired to continue her mom’s legacy, Stroud has committed her life to helping others achieve optimal physical, mental and spiritual health as naturally as possible. Sol Kissed Vegan chronicles Stroud’s transition to better health through exercise and nutritionally delicious foods that are kissed by the sun. CEOMOM had the opportunity to get personal with Stroud as she shared how she will honor her mom’s memory through holistic living and her passion for helping others do the same. Who is Maisha Stroud? God has led me in multiple directions, Sol Kissed Vegan being one of the most purposeful. I am a wife, a mother and a leader at work. I love what I do professionally, but I was looking for more purpose. Sol Kissed Vegan gives me a new found purpose. I’m learning and taking in all that I can in this season of my life. Tell us about your brand Sol Kissed Vegan. Who do you serve? Sol Kissed Vegan is an online platform to inspire women’s complete health, mind, body and soul. We have health related articles including recipes and nutrition information. We encourage our readers to eat foods that are kissed by the sun such as fruits and lots of green vegetables. Sol means sun in Latin. We also provide exercise tips as I share my own workout journey. I like to connect with my audience by allowing them to participate in my health journey. We also want to encourage mental health and nurturing your soul to heal and cultivate it. blood pressure and it was very high. One of the nurses recommended a vegan and plant based cardiologist. I went to him and he ran a number of tests. I had high blood pressure, high cholesterol and on my way to having angina. I was 38. I was thinking I was too young to die. He gave me two choices. He told me I can prescribe all of the medicine in the world or you can do what I say and I can reverse this. I am a person who doesn’t like to take medicine so he gave me the second option which was to not eat meat and dairy. I thought, oh my goodness. He put me on a raw plant based diet for five weeks. The first week was horrible. The second week was horrid and then the third week was amazing. By the time I got to the third week I had so much energy. I had lost weight. I became a vegan because I was having heart issues. I was so excited about how much better I felt that I continued with it after the five weeks. One of the things that kept me motivated was the way that I felt and the fact that my husband did it with me. What inspired you to share your health journey with others through Sol Kissed Vegan? I think I started because I just needed some accountability. I needed a way to share what I was doing and have people watch me. Then it grew into people asking me how I got started. They were curious about my journey. Since people were asking I decided to share recipes with them. I wanted to share that I was not just eating salad everyday. As it grew, I was always thinking about my mother. Although she was diagnosed with cancer, she was using natural products for her healing. I wanted to do what she was doing which was eating more natural foods. She would make her own salad dressing and dish detergent and laundry detergent. I think till this day that if she hadn’t made more natural changes she would have passed earlier than she did. With the Sol Kissed Vegan brand I want to share not just my diet but the things I am doing on my journey. In addition to your lifestyle brand you are a lawyer. What kind of law do you practice? How do you balance a career in law with running Sol Kissed Vegan? I work at an oil and gas company. I work with our legal department. I am responsible for a team of people who maintain the leases for our company. That means we have to make sure we are in compliance with everything the landowner wants. If we are not compliant we can cost the company time and money. I am not an attorney for the company but am an attorney by trade. How have your fitness and nutrition choices impacted your family? After walking this journey with me, my husband is now vegan. He is probably doing a little bit better than I am. He tries to eat very healthy. His downfall is sweets. Mine is more savory foods like salsa and chips. He actually eats a little bit better than I do. He is very conscious about getting his smoothie in everyday. I am trying to do better on that. My husband has lost weight, too. At home my girls are not fully transitioned. We try to make sure they eat what we eat. I don’t cook separate meals. Outside of home they have more freedom to eat non-vegan meals. Where do you see Sol Kissed Vegan in five years? I have a podcast or a book in me. There are so many things that I want to share. It would be helpful to women, who like me, wear many hats. There are many times you just ignore yourself because you are always giving. One thing my mom said to me when she was in the hospital was, “Maisha, I am really scared for you. I feel like you are not taking care of yourself. You need to focus on taking care of yourself. If you don’t, you will not be able to take care of your family.” That rings in my proverbial ear even now. I feel like there are so many people who are in the same boat. I believe God has really placed this in my heart with my mom passing and me having heart trouble. There are so many things he has challenged me with and I have had to rely on my faith. There are other women who have worse circumstances who need to hear my story. That constantly rings in my head. Right now I still struggle with grief. I haven’t called a counselor yet. I ask myself why. In the back of my mind I hear my mom encouraging me. What are some of your favorite holiday dishes to make? People believe you can’t enjoy the same things you used to enjoy after becoming a vegan. You can. One of the things I love to make is spicy garlic greens. I make those for Thanksgiving and Christmas and my friends and family eat them and ask for more. I make mac and cheese using soaked cashews and nutritional yeast. You wouldn’t know that it is dairy-free. My mom loved it. My dad loves it, too. My husband usually hates mac and cheese and he loves it. To follow Maisha Stroud and Sol Kissed Vegan, visit https://www.solkissedvegan.com. collaboration among women. We have done a few events to collaborate with other women. We also have a blog where we spotlight women. We want to give the community a platform to share what they are doing. We collaborated with a fitness instructor in Atlanta. We did a makeover event and focused on the beauty industry. We also did a cooking event with a chef. We want to provide the community with tools for a healthy lifestyle. Your career includes being a model, professional cheerleader and dancer. How did you transition a career in the performing arts to being an entrepreneur? I have been dancing most of my life. As soon as I became 18, I started dancing professionally. It is my why. It is my passion. Through my dance studio I am able to sow into the lives of young children. When the time came to transition into a career from professional dancing, I wanted to continue to do what I love which was dancing and sharing my talent with others. While I was still dancing professionally, my mom and I got together and said, “Let’s start a business together.” We were able to include my love for dance. We recently celebrated our 10th year in business. I love being able to impact the youth and share my talents and gifts with them. Being able to see them grow and come out of their shells means so much to me. Growing up, I never thought my career would involve dance. It is a blessing to be able to do what I love. What inspired you to create Kloset Kouture Boutique? It was one of those things that fell into my lap. What woman doesn’t love adding new things to her closet. I was helping a cousin who loved my style. She was opening a boutique and asked me to help pick out items for the store. I started out as a buyer for her. I would pick up holiday pieces for her. She decided that she didn’t want the store anymore. She asked if I wanted to take the business on as my own. I created a store that is very relatable. We have a little bit of everything for everybody. I wanted to be sure that everything was practical and trendy and eye catching, drawing everyone’s attention. Tell us about the new clothing line you are launching with your sister. What can people expect from this clothing line? Describe your signature pieces? For the launch the focus is on athletic wear. We wanted to include everyday wear. Everyone is not a dancer, but everyone loves a comfy pair of leggings and sweatpants and a tank top. The first part is more geared towards athletic wear so you will get a lot of leggings. We also have tank tops that have inspirational sayings on them. As we grow, we will release more dancewear for people who love to dance. I tell people if you don’t know what you want to do, let God order your steps and look for your passion. Find your why and just know as a mom it is going to be hard. You had an extensive career as a business owner and performer before joining WAGS Atlanta. How has being on WAGS Atlanta helped you grow professionally and personally? It was quite the experience. It definitely gave me a platform for my businesses and my brand. E! is a major network. It has a really big international following. For instance, my husband and I were on vacation in Greece and someone spotted me. I keep my circle very small. Being in the public eye forced me to come out of my comfort zone. The show was very positive on a personal level. It pushed me to do things I would have never done. That was a big leap for me. Now, I’m able to push the initiatives I have coming up. This past summer you spoke at SET, a conference about finding your hustle. What advice would you give to a mom who is struggling to find her hustle? I would say number one, find your passion. I tell people if you don’t know what you want to do, let God order your steps and look for your passion. Find your why and just know as a mom it is going to be hard. It is hard being a mom while trying to take on a career of your own. There is not a perfect balance. Sometimes it is a juggling act and you have to be able to compromise and move things around. I would also say, don't compare yourself. Collaborate with other people and empower each other. Find your village and don’t be afraid to ask for help. I had to look back and say, “This would have been easier if I would have asked for help.” Find your tribe. Use your resources and connect with other women. Learn more about Kierra Anderson Douglas and S2 the Brand at https://s2thebrand.com. THE VOICE FOR MILLENNIAL MOMS OF COLOR Christine Michel Carter is an award-winning writer and global communications strategist who has written for major publications such as TIME, Entrepreneur, Forbes, HuffPost, Black Bride, Retail Customer Experience and Inc. Called the “voice of millennial moms,” Christine has been featured in media giants including The New York Times, EBONY and Women's Health. She is also the creator of Mompreneur and Me, the first national parent and child-friendly networking event. As a thought leader, Christine is on a mission to debunk myths and misconceptions about millennial working moms, especially women of color, and give them a distinct and recognized voice in the marketplace. CEOMOM chatted with Carter about her role as the “voice of millennial moms” and why it is okay to be defined by motherhood. Who is Christine Michel Carter? I am a global marketing strategist and a writer for publications like Forbes, 21 Ninety and xoNecole during the day. All of my writing centers around millennials: black millennials, millennial moms and millennials in the workplace. I'm proud to have been called the “voice of millennial moms” because I'm very passionate about moms showing they can have a career and be a mother. I have a 7-year-old and a 3year-old. They pretty much fill my nights! What does your role as a global marketing strategist entail? How have you been able to help companies appeal to millennial moms of color? Over a decade ago when I owned a retail marketing firm I positioned myself as a thought leader for marketing to millennials (then called generation Y). Stacey J. Gholar lives by the mantra that life should be lived to the fullest 365 days of the year. Through her platform LIVE365 Empowerment, Gholar works to equip women to do the same. LIVE365 Empowerment is an online guide that helps overwhelmed women create structure to live more productive lives. From health and wellness seminars to career and personal development workshops and her podcast, Stacey J. wants to position women to live more centered lives void of unorganized chaos. CEOMOM spoke with this mom of 2 about the future for LIVE365 Empowerment including a multifunctional center, and how a life changing event inspired her to take bigger chances. Who is Stacey J. Gholar? I am a woman who continues to evolve daily. I am driven by purpose and the desire to live my best life while here on earth. There are several layers to me. I’m a funny gogetter who loves to talk, travel, eat and have a great time. At my core I’m a seeker of life and all the beauty it has to offer but when it comes to titles, I’m a mother of two boys as well as a bonus Mom, an entrepreneur and radio personality. Â It all starts with our mental health. In order to live a more joyful life that gives you the peace you desire, you must be willing to reconstruct a new way of thinking. Travitt, Tarra Jackson, LeAnn Amos-Reed, Niya Brown Matthews and keynote speaker Lisa Raye McCoy. Look at God and my daddy! The message I wanted to relay was for women to challenge themselves to live their lives every day on purpose. It all starts with our mental health. In order to live a more joyful life that gives you the peace you desire, you must be willing to reconstruct a new way of thinking. I make sure that when I do events, I over communicate the importance of being intentional and taking responsibility for your own life. My goal is to push them from stagnation to implementation. Your signature catchphrase is “Live your life on purpose.” What does it mean to live a purposeful life? For me, I believe we aren’t here by luck. We all have a purpose and although some people may not know what that purpose is, you should still live on purpose. Life is a gift that’s not promised. I like to be blunt when I talk about life, meaning if you’re dead you have nothing to worry about. But if you were blessed to have another opportunity to open your eyes and all your body parts are working at least 50%....my dear you are WINNING! Let’s face it, none of us has any control of what life does. You can have 3 good days and then the next 4 can be bad, that’s just the way things go. I’ve learned that if you want to live every day to the fullest then you need to take YOUR life and do what it is that makes you thrive! Living your best life must be defined for you by you. Stop letting outside sources dictate whether you are happy, sad or angry. For the last 2 years, I’ve been focusing on my personal development and awakening to who I want to be. That takes work because you are redefining all that you’ve become accustomed to. Enjoy life in the now and make the changes as you go. The now is all you have, and I love who I’m becoming because it’s a new acceptance of me. It’s true when you change your life you can change your circumstances, environment, and the people you attract. Where do you see LIVE365 Empowerment in five years? My goal is for LIVE365 to be a one stop shop. I want a standalone building to house a variety of resources, services and events. I want our center to focus on the lifestyle needs of women and girls. My desire is to assist these women and girls with health/wellness, personal development, entrepreneurship/business and more! I will open other offices around the world with Atlanta being the headquarters along with small chapters in other cities. It will be open to the public with the opportunity for memberships for those who want to continue their quest for better holistic living on a consistent basis. The now is all you have, and I love who I’m becoming because it’s a new acceptance of me. You are building an amazing brand with LIVE365 Empowerment, events, e-books and more. What’s next for Stacey J. Gholar? What’s next for me? Wow I truly feel the possibilities are endless. As of now, I’m excited about my new podcast show Real Talk with Stacey J. which is a lifestyle podcast that educates through empowering conversations. Real Talk with Stacey J. is designed to help women live their best lives on purpose, in a raw and unedited way. I am looking forward to the possibilities of adding LIVE365 Cares which will cater to the homeless, women shelters and girls in need. I want to work on my book and eventually a product line of healing products. I have several great ideas that I’m playing with so be sure to stay connected with me. In the meantime, check out the podcast on the website, anchor.fm/realtalkwithstaceyj, Google podcast, Spotify, Breaker, Castbox, overcast, Pocketcasts, Radiopublic, Stitcher and SoundCloud. Learn more about Stacey J. Gholar and LIVE365 Empowerment at https://www.live365empowerment.com. Connect with her on Instagram @therealstaceyJ. REVOLUTIONIZING THE WINE INDUSTRY Amanda Thomson grew up in a health conscious household where the ingredients used for cooking were just as important as the dish itself. Now Thomson, founder of Thomson & Scott, and winner of the EY Winning Women 2017 and the Le Cordon Bleu Entrepreneur of the Year 2017, has taken this philosophy to the world of wine. In her quest to make the wine industry more transparent, Thomson has created a 100% organic and vegan certified sparkling wine brand that empowers consumers to ask whatâ&#x20AC;&#x2122;s in their bottles. CEOMOM caught up with Thomson after her recent launch of the European brand in the United States to learn more about her vision for a healthier bubbly and what it means to be a woman in a male dominated industry. What inspired you to create the Thomson & Scott brand? I grew up with a health food conscious mother. We were vegetarian and followed a no sugar diet so I didn't have a lot of sugar or processed foods as a child. I am in my 40’s. My mom was quite early to the game. In 2018, we found ourselves in a very relevant place for the Thomson & Scott brand. Now consumers are looking at ingredients more mindfully. I had nothing to do with the food and wine business prior to starting the Thomson & Scott brand. I went into journalism and broadcasting. I was an arts broadcaster. I was a good talker. I used to do a lot of television and radio with the BBC. The synergy with that and what I am doing now is why I love champagne. Champagne is what made me feel good. I really romanticized immersing myself in the champagne world. I think it is really an exciting time for any woman who wants to get into the wine industry. That mustn’t be underestimated. Go into the wine business if you have a real passion for it. I started to look at what was being added to champagne and wine. Now smart consumers are wanting to know more about what they are consuming. I thought there was a huge opportunity to have a more transparent approach to wine. I persuaded my husband and young children that we should move to Paris and I threw myself into studying at the Le Cordon Bleu School. They started a new wine concentration. I wanted to concentrate on the holistic part of the wine industry. The program covered marketing and more. I threw myself into that and then I met a new champagne maker who wasn’t adding sugar to his wine. I decided I could create a brand where everything was made of top ingredients and we were being honest about what was in the bottles. That is how it came together. I wanted to put the skinny in the front of champagne. This started noise globally and allowed me to add to the conversation about what was in the wine. The only way you want to go into a business without a plan b is if you are super financially stable. If you have an incredible idea and you feel like something isn't being served, then the industry will be ready for that. Have a thick skin. Starting a wine brand is not for the faint at heart. Where do you see Thomson & Scott in five years? I really would hope to be a family trusted and exciting brand in key states. Truthfully, I would like lots of people to be inspired by what I am doing with my brand and look to being more sustainable. I would like to inspire people to be much more mindful of what they are putting in their bottles. You have to ask yourself how a bottle can be that cheap. As a mom and entrepreneur what does a typical day look like for you? Would you say you have achieved balance? Why or why not? At the moment I am traveling so much. I’m grateful to have a partner who is picking up the slack. I am also lucky that we live near our family. My job is often to let other people have fun and to always be selling my brand and telling my story. I am not a morning person. I am naturally a night owl which is great for me but not for school activities for kids. If I get 7 hours of sleep I can function at a pretty crazy pace. I try to be very conscious to get enough sleep. I try not to have coffee after lunch and not to get to bed after midnight. Now I can sleep because my kids are 10 and 16. When I am not travelling I try to do a power yoga class. In America I go to SoulCycle. The typical day for me doesn’t exist but I am trying to find ways to balance that. It’s not always realistic for everyone around me like my family. I have a lot of energy and I try not to drive everyone around me mad. Which of your wines is your favorite during the holidays? It’s hard because it’s like choosing between my children. If you are just having a quick and easy night out with friends and may not be eating very much, try the Thomson & Scott Prosecco. For an elegant, romantic and beautiful moment, the Champagne is great. I would also include my Grand Cru Brut. It is a really good foodie wine. Learn more about Thomson & Scott at https://www.thomsonandscott.com. WE HELP YOU GET WHAT YOU NEED IN LIFE. 1. Preheat oven to 400°. 2. Place parchment paper on a baking sheet and spray with olive oil. 3. In a medium-size bowl, mix together all the ingredients. 4. With an ice cream scoop, create 1” balls of the mixture and place about an inch apart on the baking sheet. 5. Bake for 25-30 minutes until lightly brown. Can be served as a side dish or hors d’oeuvre. RECIPE BY: CHEF ZIPORA EINAV Chef Zipora Einav (www.chefzipora.com) is an accomplished private chef who has cooked for some of Hollywood’s most notable celebrities - Bob Hope, Jack Nicholson, Mariah Carey, Pierce Brosnan, Scarlett Johansson - and for professional athletes, including former National Football League star Donovan McNabb. She is the author of Recipe for a Delicious Life, which includes recipes, a classical music CD titled Music for a Delicious Life, and her anecdotes and adventures while travelling the world as a private chef. She founded her company, Chef Zipora Enterprise - Comfort Food in Harmony with Your Health ™ - to improve people’s lives by empowering them to eat well and embrace a healthy lifestyle. The company achieves this through its food, music products, books and edutainment programs. 1. Looking for an infertility or miscarriage, infant and pregnancy loss support group?